By the end of the nineteenth century, Istanbul’s Armenian population had become an integral part of the capital city. Following the 1453 Ottoman conquest of Constantinople, the Armenians of Istanbul prospered from a small group to a well-formed community, within which was a network of fifty-five Armenian Orthodox churches and a central cathedral. The end of the Ottoman empire in 1923 along with other resulting turmoil took its toll on this unique infrastructure, however, with both social and religious consequences. With the cooperation of the Armenian Patriarchate of Istanbul, Professors Ronald T. Marchese (University of Minnesota) and Marlene R. Breu (Western Michigan University) have brought Istanbul’s Armenian Orthodox sacred textiles to light, in a work featuring over 170 fine color photographs, background history, and a survey of various churches. While the men of bygone Armenian Istanbul were of all classes, from noble to merchant to trade and labor, the women of the families found community and expression in depictions of such holy subjects as the Virgin Mary, the life of Christ, the Magi and various saints. Utilizing materials like copper, gold, and silver thread and wire, along with human hair, jewels and silk, these wives, mothers, daughters, sisters and aunts stitched Bible covers, chalice veils, altar curtains, mitres, and other vestments with such skill and attention to detail that their efforts soon became revered as the “Constantinople Style” of religious embroidery. 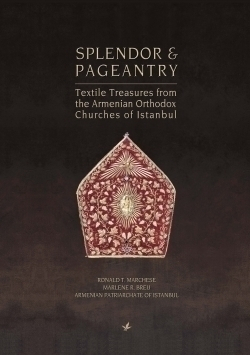 Splendor and Pageantry: Textile Treasures from the Armenian Orthodox Churches of Istanbul offers a singular survey of the culture of the times and the textiles produced, including the sensual and natural imagery of the pieces to an actual list of ingredients found in the Holy Myron Oil (saffron, sweet violet, and rose water, to name a few) used to consecrate them. For textile lovers or creators, the book will surely be an inspiration—and for those of Armenian heritage, the work will be a true pageant of talent, legacy, and reverence.